The domino damselfish, also known as threespot dascyllus, comes from the Indo-Pacific ocean region. This is an popular fish used for cycling new aquariums. As these fish mature they will become more aggressive and problematic to smaller or milder species. Care Level: The domino damselfish is a hardy fish. It can tolerate conditions that could easily kill other fish, hence the reason many people use these fish to “cycle” new tanks. On a scale of 1 –10, (10 being easy) it would rate a “10”. Tank Conditions: Temperature 77 - 79°F; Specific gravity: 1.020 – 1.024; pH: 8.1 – 8.3; nitrate should be no more than 20 ppm. 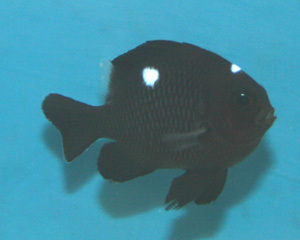 Color: The domino damselfish is almost totally black with three white spots. One spot is on each side of its middle back and one on top just before the dorsal fin. Being that its coloration is very basic, it is quite a striking small fish. Temperament: The domino damselfish is not overly aggressive as a juvenile but as an adult can (and usually does) become aggressive not only with others of its kind but also with smaller and mild mannered fish. Do not put two domino damselfish in the same tank – they will probably fight. It would also be wise to introduce the domino damselfish as one of the last fish into the tank as they can become territorial. Reef Compatible: Yes – the domino damselfish are very reef friendly. They will not bother corals and should leave all invertebrates alone. Diet: Omnivore - will take a varied diet of chopped shrimp, brine shrimp, chopped squid and clams as well as flake food and plant matter such as spirulina and marine algae. They should be fed 2 times each day. High quality vitamin enriched foods should be fed several times each week. Also – they will graze on live rock algae. Habitat: Provide with plenty of hiding places and live rock growth for grazing on and to use for shelter. Good water quality is not overly important since they can tolerate varied conditions – however with that being said, a good hobbyist should strive to maintain the best possible conditions for their pets. Damselfish need good water quality for health and color retention. Lighting: No special requirements are necessary. 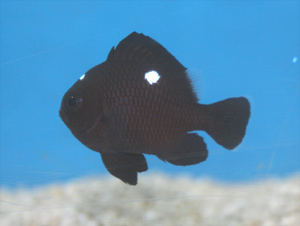 Compatibility: Domino damselfish in general can be kept with small fish such as dwarf angelfish, puffers, and cardinalfish. They should not be housed with sharks, rays, large species damselfish, moray eels and groupers. It can be a problem if housed with triggerfish and larger fish that can view them as prey. Check with your aquarium shop if you plan on buying one of these fish.